The basis for this premium version of our Cha Khao Hom Thai Rie Tea are leaves of the Jin Xuan tea cultivar. In north Thailand, this originally Taiwanese tea cultivar is at home since the 1990’s only. 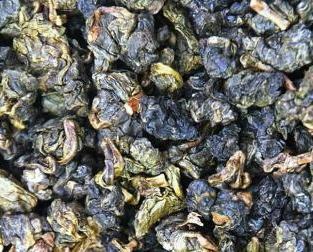 Besides its standard processing to a medium-oxidized Oolong tea, the highly versatile cultivar provides for some more tea specialties. Among these are, for exeample, our DMS Jin Xuan Black Pearls Black Tea and our DMS Jin Xuan Hoarfrost Oolong (Jin Xuan winter picking). And, of course… this version of the exclusive Thai tea specialty “Cha Khao Hoom” Thai Rice Tea. 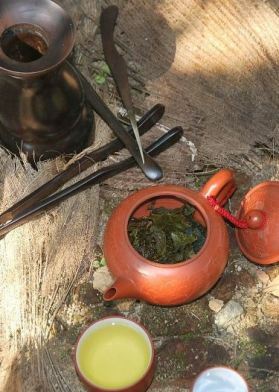 In the nomenclature of this tea, “DMS” stands for the region of cultivation, which is Doi Mae Salong in North Thailand. Then, “Cha Khao Hoom” is the Thai language word for “rice tea”. And “Premium” indicates that what we have here is the premium version of Cha Khao Hom Thai Rice Tea. Our producer partner in north Thailand still picks all of their teas carefully by hand. Accordingly, this also applies to the Jin Xuan tea leaves providing the basis for this tea. At this, picking standard for all high grade Oolong teas is the young bud at the end of each branch, plus 2-3 adjacent leaves. The flavoring The flavoring takes place through the addition of a special, locally wild-growing herb to the tea leaves during processing. In English language, this herb is known as “Sticky Rice” herb. However, its original Chinese name is “Nuo Mi Xiang Nen Ye” (= “sweet rice fragrance tender leaves”). The herb bestows a decent rice aroma on the tea leaves. Actually, what we have here is not so much a flavoring in modern terms, but much rather a scenting in the classical sense. The process takes place under heat feed, and without using any artificial aroma substances. Once the scenting is complete, the aroma donor is rolled together with the tea leaves to characteristic granules. 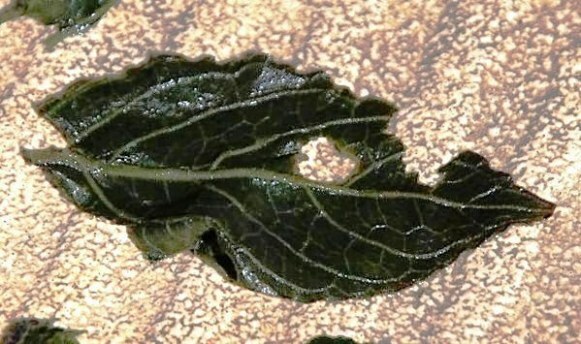 Hidden within the granules, the “sticky rice” leaves are no longer visible to somebody looking at the dry leaf material. 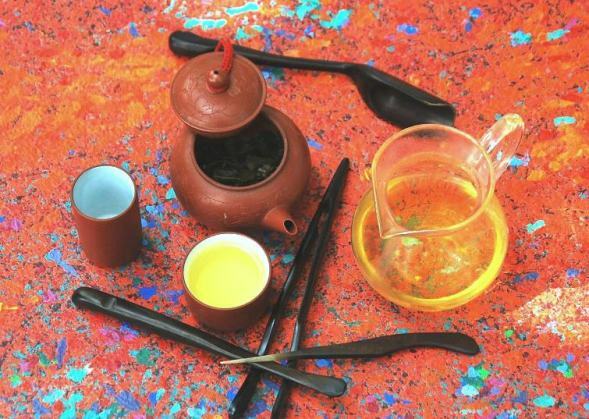 The combination of a high-grade oolong tea and the aroma donor result in a harmonious, finely balanced taste experience. At this, the mix of flavors is homogeneous to a degree that makes it hard to tell the gently tart, nutty and creamy taste of the Jin Xuan Oolong from the aroma donor’s rice (or better: sticky rice) flavor. By the way, Cha Khao Hom Thai Rice Tea is expressively no Genmaicha, and nothing like it either. As opposed to Genmaicha, Thai Rice tea doesn’t contain any rice grains, and its processing doesn’t involve the use of such either. In Doi Mae Salong, center of tea cultivation in north Thailand, tea is the local ethnic Chinese and surrounding tribal communities’ major cash crop. Besides the native Assamica type tea tree, there’s a number of Taiwan-imported tea varieties growing here since about the 1980’s. One of these is the “Jin Xuan” or “N° 12” tea cultivar. In the mountains surrounding Doi Mae Salong, the tea plant findes optimal thriving conditions at altitudes between 1200 and 1600 meters. One of these is the local climate, consisting of 3 seasons. These are a rainy period, a hot and dry period and a cold period. For best taste results, use water of a temperature around 85°C. First, pour 200ml of the hot water over 3 grams of DMS Chaa Khao Hoom Thai Rice Tea granules. Then let infuse for 2-3 minutes, according to individual taste. A series of follow-up steeps will further reward gourmets with individual flavor profiles.